Who's up for a game of Football Football? Do you think kids football is sometimes taken too seriously? Are you fed up of seeing young footballers waiting on the touchline to get a game or stuck out on the wing waiting for a touch of the ball? If so, then you'll no doubt be interested to hear about Football Football, a new national football programme that aims to make the game fun for kids. Operating in 26 locations nationwide every Saturday morning, Football Football is open to children of all abilities aged from 5 to 12 years of age and is designed to be fun and inclusive for everyone. 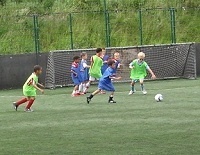 All games are played with a maximum of 5-a-side and a ratio of no more than 10 players to every FA qualified coach. Of course, fewer players means more dribbling, more passes, more shots, more goals and more fun! The team at Football Football are trying to give the game back to the kids. There are no substitutes in any of their games meaning every player is involved all of the time, plus you'll find no league tables and no points up for grabs - elements of the adult game which don't translate well to kids football. Having launched in May, the Football Football programme is setup to reach thousands of children across the country, in inner cities and large towns where chances are often limited - for example, participation in London is 50 percent lower than the national average - while the programme aims to help address the fact that over one million children in would like to join a team*. To encourage kids to take up the game, enjoyment is key to what Football Football is about. The aim is to get kids to fall in love with the game by providing a full-on football experience that takes the positive values of the street, park and playground football experienced by past generations, but then provide this in a safe, fun environment with first class facilities. This last point, as we all know after our recent Facilities Tour, will sound like music to the ears of many Club Website members. It is also something that Nigel Hargreaves, founder of Football Football will be well aware of after almost a decade at the Football Association, where he was the Head of Strategic Development from 2001 to 2009. Hargreaves has developed the Football Football programme with Paul Cooper, founder of the Give us back our Game campaign so, between them, their experience in the game means they know what needs to be done and what the children want. 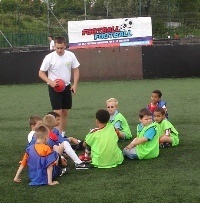 Having worked with children in football for over 20 years, Paul knows where the focus of programme must lie. “The children are central to the programme," he says. The programme has already received the support of the English Football Association, whose National Game Strategy recognises that people want football "on their doorsteps" and in "more flexible formats", just as Football Football provides. So, with the support of the English governing body behind them and a UK-wide expansion already underway with a branch opened in Paisley, Scotland, Football Football looks likely to go from strength to strength over the season ahead. Their fun summer programme - based on the skills and techniques of the nations from the World Cup quarter finals - suggests what they are all about: providing fun whilst helping the kids develop technically, tactically and socially. If you know someone aged 5 to 12 who wants to find a different place to play, meet new friends and learn new skills then Football Football could be just what you are looking for. To get involved or find out more visit www.footballfootball.org.